It's the kind of beast Steven Spielberg might feature in a movie. Villagers in Bunawan township in the Philippines celebrated what they hope is the end of a reign of terror when they captured a 21 feet long, 2,370 pound crocodile. Two years ago, a child was eaten by a crocodile that was never caught. Since July, a fisherman went missing, and a croc is a prime suspect. Villagers also reported that they saw a crocodile kill a water buffalo this summer. 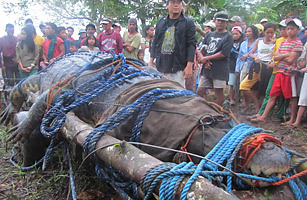 But this week, using steel cable traps and an animal carcass as bait, they caught the beast and it's the largest crocodile ever to be taken alive. It took nearly 100 people to haul the monster from a creek, then a crane to lift it into a truck. While this capture may set Guinness Book records, there are still an estimated 250 such giant freshwater crocodiles still in the wild and roughly 1,000 of the saltwater variety. So perhaps they shouldn't celebrate too quickly. And don't forget Spielberg's classic film Jaws in which the residents of a town terrorized by a great white shark rejoice when one of the creatures is killed, only to learn a harsh lesson later  -the real culprit was still out in the water. We hope the real life story has a better ending. See photos of a dinosaur-era crocodile found in the Sahara.